Audi India has been doing very well in this year; the company has launched four brilliant vehicles in the Indian car market. The company first rolled out the amazing two door sports car, Audi TT, which was followed by a new version of Audi A4. Then came in the magnificent luxury sedan Audi S4 and lastly the eagerly awaited baby SUV, Audi Q3, which was soft launched on the 6th of June in the Indian car bazaar. Audi Cars in the country have been associated with the rich and the famous and with this new 5-seater SUV the company will now be able to reach the other income group of people as well. This brand new Audi Q3 is being offered only in a diesel variant, which is a very smart move from the company as the petrol prices are hitting the roof in the country and the majority of buyers are inclined towards buying diesel engine based vehicles. The company is offering this well built SUV in a couple of variants namely, the base grade and the top end model, which is loaded with remarkable features. The Audi Q3 Price for the base variant is Rs. 26.71 lakh, while the high end version comes with a price tag of Rs. 32.10 lakh, both prices mentioned are of ex-showroom New Delhi. 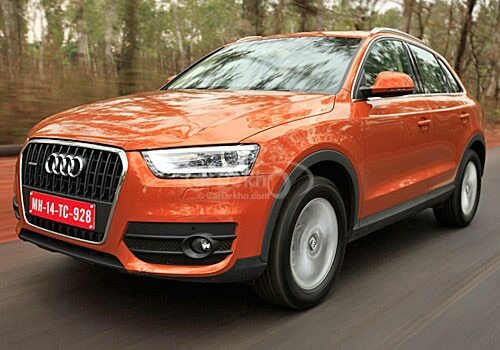 The exteriors of this majestic SUV are simply brilliant with a smooth and lustrous body line, which are clearly visible in the Audi Q3 Pictures. Under the hood, this muscular SUV has been fitted with a 2.0 litre TDI diesel power train, which can displace around 1968cc. This performance packed engine can deliver a peak power output of 174 PS at 4200 Rpm along with a maximum torque of 38.74 Kgm at 1750 – 2500 Rpm and is cleverly mated with a 7-Speed direct shift gear box with S-Tronic transmission. 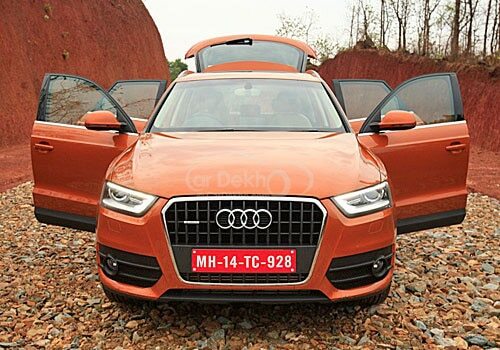 This brand new Audi Q3 has a top speed of 212 kmph and can cross the 100 kmph barrier is just about 8.2 seconds. The impressive Audi Q3 Features comprise of some top quality safety and comfort features, which the company engineers have carefully incorporated in this sturdy SUV. Some of these remarkable features are electrically adjustable, foldable and heated wing mirrors, rear parking assist, cruise control, driver infotainment system with music interface, Bluetooth connectivity and voice control, 4-Spoke multifunctional steering wheel with controls, a set of stylish alloy wheels, rear side airbags, anti-theft protection and numerous other features, which will entice the customers. With such amazing safety and comfort features on the inside along with a power packed engine and arresting exteriors, this new Audi Q3 will certainly become on the top sellers from the stables of Audi India. Meanwhile, several other upcoming SUVs such as Tata Safari Storme, BMW X1, Premier Rio Diesel and Mahindra SsangYong Rexton are also expected to be launched in the country’s car market in the coming future. I shared that Renault launches the impatiently expected Duster SUV in the Indian market.